Blind and partially sighted chess players have a much stronger presence in the international chess world than many may realize! Playing chess without the use of one’s eyes requires being able to “see” the layout of a chess game in the mind. In reality, this isn’t dramatically different than the way sighted people play chess. Sighted people are simply used to the extra visual input of seeing the board laid out before them. Support, education, and chess-based community for blind players are readily available from national-level Braille Chess Associations in a number of countries across the world. These associations offer chess lessons, access to Braille learning material and chess sets, as well as chess tournaments specifically for blind and partially sighted players. Playing chess without the use of one’s eyes requires being able to “see” the layout of a chess game in the mind. The FIDE-affiliated International Braille Chess Association’s (IBCA) influence reaches across North America, South America, Europe, Asia, and Africa. FIDE has also established a few guidelines for anyone playing a tournament game against someone who is blind. ● Tape recorders may be used instead of traditional scorecards, so that the blind player may keep a record for future analysis. Two of the larger national-level Braille chess associations are The Braille Chess Association of the United Kingdom and the United States Braille Chess Associaition. The Braille Chess Association of the United Kingdom is dedicated to furthering the chess education and skills of players who are blind or partially sighted – including those who don’t use Braille. The BCA offers a wealth of materials and resources, hosts tournaments, and also encourages blind players to participate in non-blind chess events and competitions. Membership for sighted UK residents under age 18, and for blind and partially sighted UK residents under age 25 is free! BCA members may have the opportunity to play in BCA-run events as well as to represent the association in other events all over the world. Members are also granted access to a number of other resources. 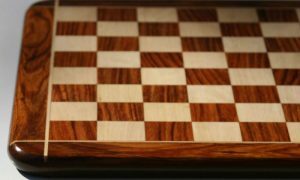 ● Access to a library of e-books and audiobooks about chess. The audio materials are available in a few formats, cassette, compact disc, or mp3. ● BCA Shop discounts. 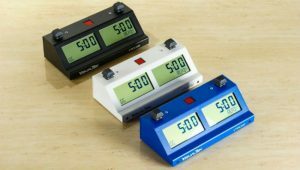 The BCA operates a small online shop, selling tactile chess sets and talking chess clocks at a discount for members (limit one set per member, due to limited quantity). They also sell polo shirts and tote bags (that are the perfect size for a small chess set and a chess clock) with the BCA logo. Polo shirts and tote bags with the BCA logo. For inquiries about membership, or to make a donation, please send an email to customerservices@braillechess.org.uk. The United States Braille Chess Association is also making an impact on the world of chess for blind players. US BCA membership dues are $15 bi-annually. 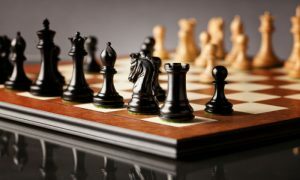 Among other perks, members are eligible to participate in casual chess games with other members, as well as in the association’s tournaments (both via correspondence and in real-time). The US BCA keeps an active rating list, where all members can track their personal ratings. ● Access to an extensive library of chess books in Braille, as well as materials available on cassette and compact disc. ● US BCA Vice President Jim Thoune shares his 40+ years of chess experience with members in a weekly online class. These classes are held in the “Chess Castle” chat room on a website called Out of Sight, on Thursdays at 10:30 a.m. EST. ● For those who are brand new to playing chess, The Hadley School for the Blind offers two free online courses to get you up to speed. An amazing perk of this course is that it includes a free adaptive chess set, and an opportunity to join US BCA for free upon completion! ● Ability to play chess games (both friendly and competitive) with other members via email correspondence or in real-time via Skype. For questions about membership or to donate to the USBCA, send an email to jaylev7@verizon.net. 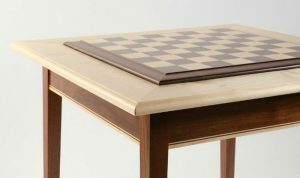 There are a few products on the market today specifically designed with blind chess players in mind. 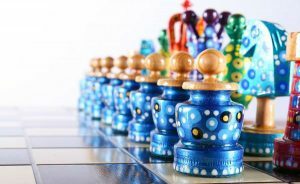 A few small tweaks to a traditional chess set can make gameplay easily accessible to the blind, and these are generally available at a reasonable cost. ● A sharp contrast between black and white spaces, often with all spaces of one color raised a few millimeters above those of the other. ● All pieces of one color will have a distinctive marking on the head (e.g. raised bumps or a metal pin) for easy differentiation. ● All pieces have a peg at the bottom, which inserts into a small hole on each square on the board. 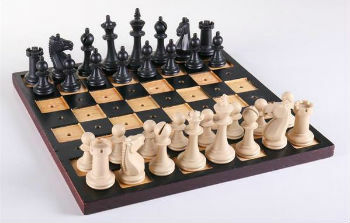 Some blind-friendly chess sets are also made with magnetic pieces instead of pegged. 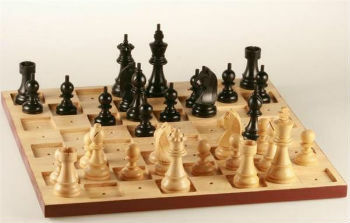 These sets will often be smaller and also function well as travel chess sets. These chess clocks still feature a digital display, but there are headphone jacks for each blind player to be able to hear how much time is left or whose move it is. These clocks are designed so that they could be set and used without the help of a sighted person. A great many books about chess have been translated into Braille or recorded in audiobook format. Getting in touch with your country’s Braille Chess Association is one of the easiest ways to get access to these titles – all in one place, too! 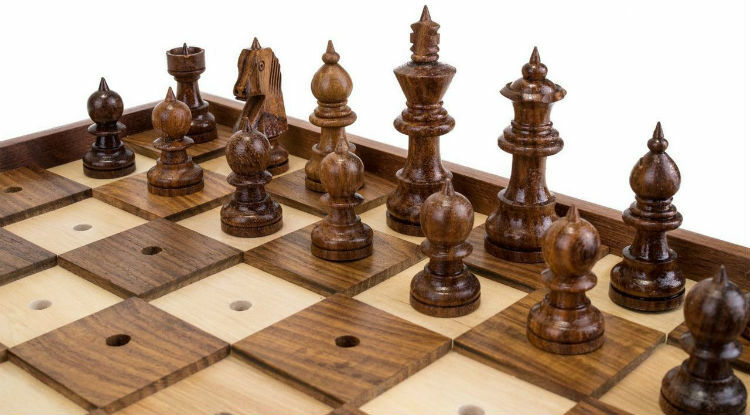 Playing chess to your heart’s content on a computer is an option for blind players on several different online platforms! BG Chess Challenge is a totally free program, in which you can specifically select blind, visually impaired, or sighted modes of play. This program also includes features like “hint” and a gameplay tutorial, making it a great choice for newcomers to the game. 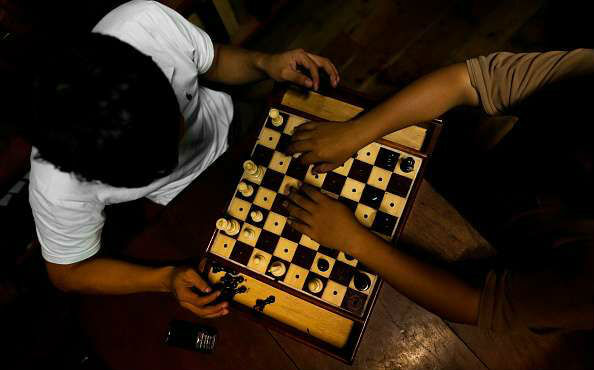 Blindfold chess is a challenging version of the game that ups the ante on multitasking and memory skills. 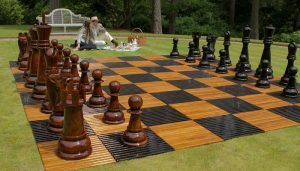 One of the interesting things about blindfold chess is that it allows full chess games to be played without any visual input – which may place some high-ranking blind chess players at a learning-curve advantage over sighted players when learning this version of the game! Blindfold chess is a challenging version of the game that ups the ante on multitasking and memory skills. As the name suggests, blindfold chess is played without being allowed to look at the pieces (though in most cases the players simply face away from the board – wearing an actual blindfold is not a rule). The other catch to this game? It’s not just one game! In blindfold chess, multiple chess games are being played against multiple players simultaneously – and no one is allowed to look at the board. 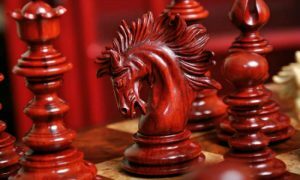 Accounts of blindfold chess games go back over 1,000 years! The world record for most simultaneous blindfold chess games played is currently held by the American Grandmaster Timur Gareyev. 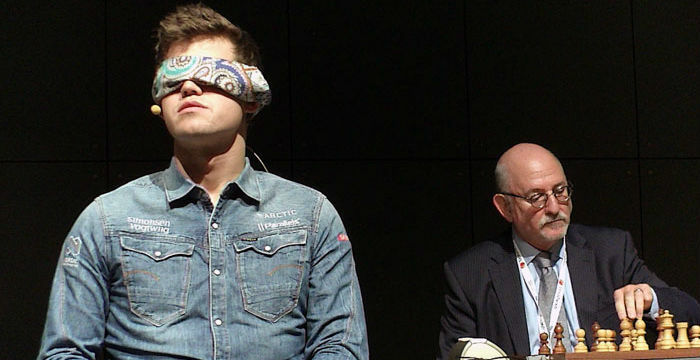 In December 2016, at the University of Nevada, Las Vegas, Gareyev played 48 games over the course of just under 19 hours – electing to wear an actual blindfold for the experience. Of these games, he won 35, drew 7, and lost only 6. Gareyev goes by the (well-earned!) nickname “Blindfold King” and publishes a monthly newsletter about his adventures, in chess and otherwise. 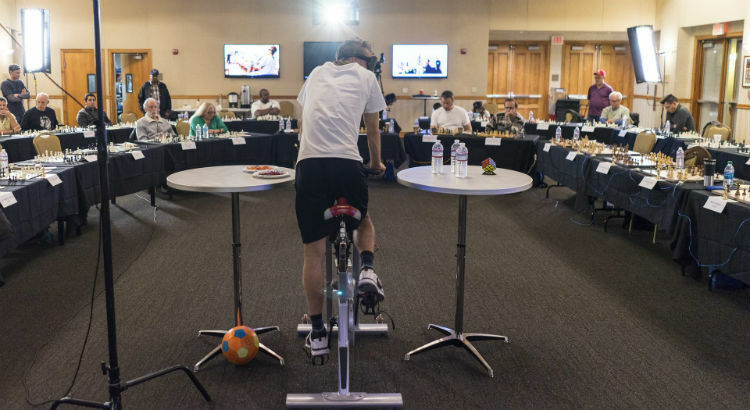 Timur Gareyev during his blindfold chess game in Las Vegas, where he set the world record in 2016. Albert Sandrin (1923-2004) was perhaps the best-known blind person to have achieved the rank of Chess Master. Since childhood, Sandrin had a vision impairment, which worsened to the point of total blindness by 1968 – at which time he was the top-rated player on the US Braille Chess Team. Already at near-total blindness, Sandrin won the US Open in 1949. He also placed second in 1952 and won the Illinois State Championship in 1944. In 1958, when the International Braille Chess Association was founded, Sandrin played (and won!) many championships, representing the United States. We feel that chess is a game that nearly anyone can benefit from learning and playing. It’s very exciting to see how many resources there now are to make chess accessible to so many blind and partially sighted players! We admire and support the collective mission of the Braille chess associations worldwide that have made this a reality. I am a teacher at the Florida school for the deaf and blind. I teach math but run a chess club after school. I am looking for resources and help especially for one fully blind boy who is very good. He only plays one hour a week during our chess club. I need to get him help and more resources please. If you can help or have ideas or connections please contact me. Thank you. You can start with the United States Braille Chess Association website. There is a link in this article. There’s an organization called Out of Sight, which provides chess instructions. Find them on their website out-of-sight(dot)net or in this Email address oosnhq@gmail.com. I hope this information helps you, and wish this kid to be a great chess player soon! US membership is now free. We welcome anyone in the world, blind or sighted.